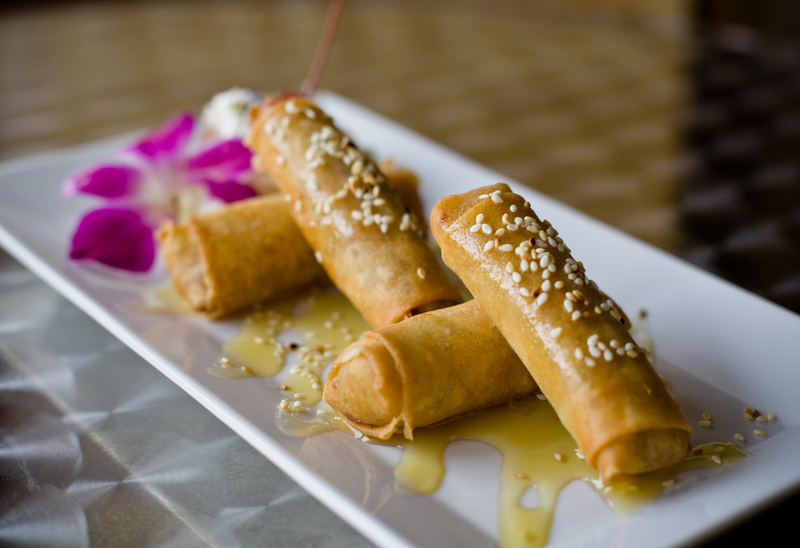 Located in Destin's Rufus Ray Plaza, Real Thai Fusion is a local Destin favorite where authentic traditional thai meets the Emerald Coast. The origin of Real Thai stems from the roots of Thailand where the chef spent years training in high end Thailand hotels and establishments. Owned by Ron and Yupin, their mission is to bring you gorgeous authentic thai dishes accompanied with traditional thai hospitality. 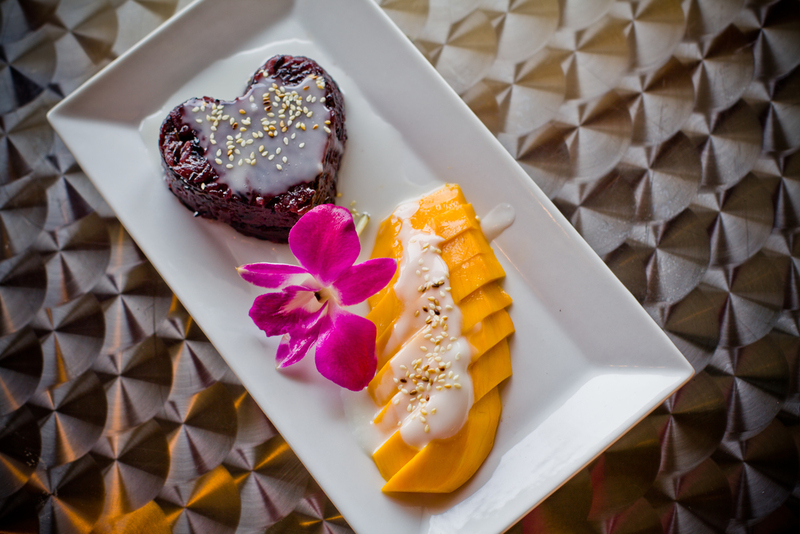 Real Thai is a traditionally decorated thai restaurant with a casual environment. Parties of 5 or more will have 20% gratuity added to their check. Please, no more than 4 credit cards per check. Crispy rice paper filled with onion, carrot, glass noodle, and cabbage. Fresh Thai salad rolls filled with basil, carrots, cucumber, and vermicelli with homemade hoisin sauce and peanut sauce. Who wants chips when there are fried Wontons stuffed with Chicken, onion, potato, and curry powder? Marinated tender Chicken breast seasoned with Thai herbs. Served with peanut sauce and cucumber salad. Crab Rangoon (5) – Number 1 selling Crab Rangoon at the beach! These crispy wontons are filled with a mixture of blue crab meat, cream cheese, carrot, onion, scallion, and a dash of curry powder. Deep-fried calamari dipped in tempura batter and served with a sweet chili sauce. This combination platter includes Spring Rolls (2), Crab Rangoon (2), Steamed Dumpling (2), Fried Tofu (2) and Calamari. Choice of Chicken, Tofu, Pork, Beef. A well-known Thai spicy soup with lemongrass, kaffir, lime leaf, galangal, onion, mushroom, bell, scallion, and cilantro. Choice of Chicken, Tofu, Pork, Beef. Coconut soup with lemongrass, kaffir, lime leaf, galangal, onion, mushroom, bell pepper, scallion, and cilantro. Ground Chicken and Shrimp in wonton wrapper with napa cabbage, carrots, scallion and cilantro. Spicy soup with Shrimp, Squid, mussel, scallop, ginger, lemongrass, kaffir, lime leaf, galangal, mushroom, tomato, scallion, cilantro, lime juice and chili. Shrimp and Chicken with egg, mushroom, bamboo shoots, scallion, chili, garlic sauce and cilantro. Ground Chicken with scallion, cilantro, red onion, roasted rice powder with a lime juice dressing on top of lettuce and cabbage. Tasty bean thread seasoned with ground Pork and Shrimp, onion, scallion, cilantro, celery and lime juice served on a bed of lettuce. Sliced tenderloin of Beef mixed with cucumber, tomato, scallion, cilantro, lime juice, and chili on a bed of lettuce. Green papaya, green bean, tomato, peanuts, fresh chili, garlic, and lime dressing on a bed of cabbage and lettuce. Tasty grilled tender Beef sprinkled with Thai lime dressing, cilantro, scallion, red onion, and mint served on a bed of cabbage, lettuce, carrots and cucumber. Stir-fried with fresh ginger, bell pepper, carrot, baby corn, mushroom, celery and scallion with a fresh garlic brown sauce. Stir-fried in a light, spicy sauce with onion, bell pepper, green bean, and Thai basil with chili paste brown sauce. Stir fried with black peppered sauce, onion, bell pepper, carrot, mushroom and green onion. Our Thai version of sweet and sour with tomato, cucumber, pineapple, bell pepper, onion, scallion, and celery. Stir-fried with spicy chili paste, green bean, bell pepper, bamboo shoot, onion, and Thai basil leaves. Thai style sautéed with a mildly spicy Prik King paste, green bean. and red bell pepper. 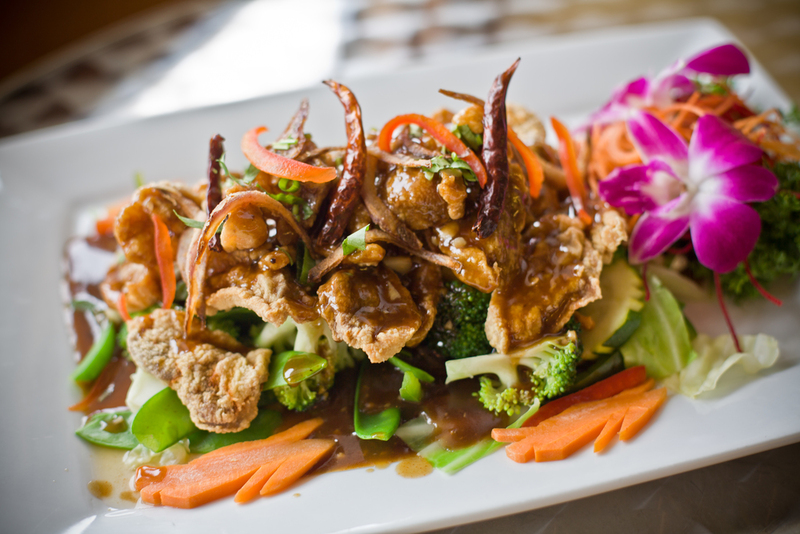 Deep-fried Shrimp tossed in the perfect creamy, sweet honey Bankok sauce with broccoli and carrots. Thai style fried flat rice noodle with egg, onion, tomato, bell pepper, carrot, and basil. Stir fried with egg, glass noodle, onion, carrot, mushroom, cabbage, scallion and bell pepper. Thin rice noodle stir-fried with egg, mushroom, carrot, onion, cabbage, bell pepper, scallion and baby corn in a spicy Thai chili sauce. 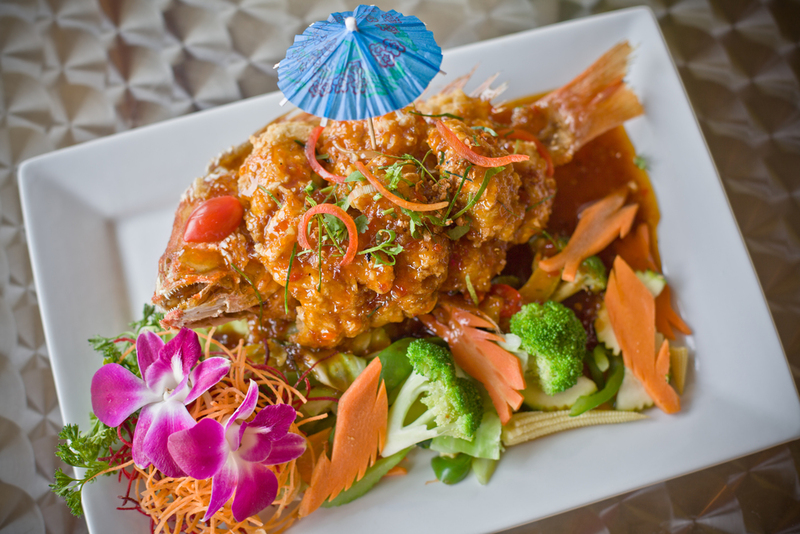 Lightly deep-fried Red Snapper filet with chili garlic sauce and steamed vegetables. 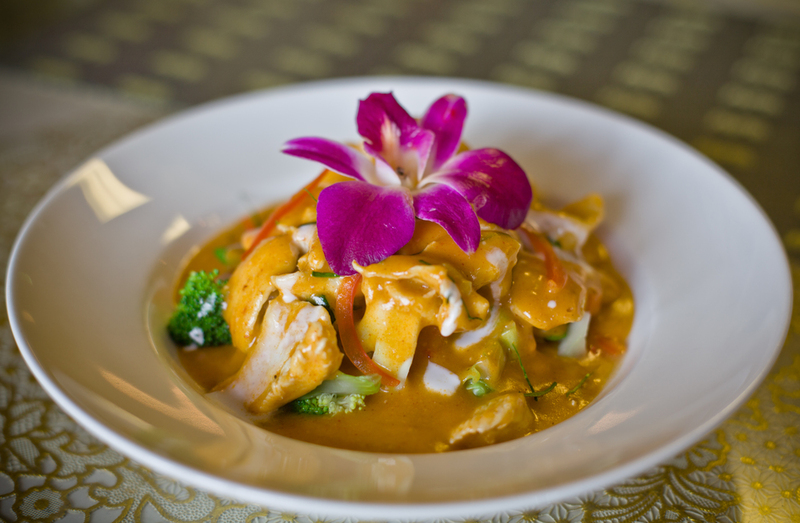 Salmon filet topped with panang sauce and served with steamed vegetables.